ORONO, Maine — International folklife expert and longtime University of Maine professor of folklore Edward “Sandy” Ives, who traveled the woods of Maine and eastern Canada to record folk songs and oral histories while teaching thousands of UMaine anthropology students, died Saturday at his home. He was 83. Ives taught at the University of Maine for 44 years, retiring in 1999. In his career he published dozens of articles, books and recordings based on his journeys to lumber camps all over the state and region. “I was interested in the songs that people sang, the guys in the lumber camps,” Ives said in a 2007 Bangor Daily News story on the occasion of some of his work being included in the National Recording Registry at the Library of Congress in Washington, D.C.
Pauleena MacDougall, director of the UMaine-based Maine Folklife Center, the origins of which Ives founded in 1971, said Ives had a “tremendous impact” on students. He often played his recordings for students, punctuating his lectures with stories and jokes. His students eventually went out into the field to make recordings of their own. Ives first taught in the English department and later in the anthropology department, where he served as department chair from 1983 to 1989. A biographical sketch written by MacDougall for a 2000 University of Maine press book “Northeast Folklore: Essays in Honor of Edward D. Ives,” which MacDougall edited with former Ives student David Taylor, now a folklorist at the American Folklore Center at the Library of Congress, reveals a glimpse of what motivated Ives’ research and teaching. In the late 1950s, according to MacDougall’s essay, Ives, then a young and struggling UMaine professor, had the idea to earn extra money singing and playing guitar at summer camps in Maine. He decided to sing shanties and lumber camp songs about Maine. His travels also altered his teaching methods, as Ives began to include the songs and stories he brought back from the woods. “What I had been offering students in the guise of literary history was something that never was … something that had more to do with the concert stage than with the bunkhouse or farm kitchen or any other normal arena of traditional song as I had come to know it,” MacDougall quoted Ives as saying. 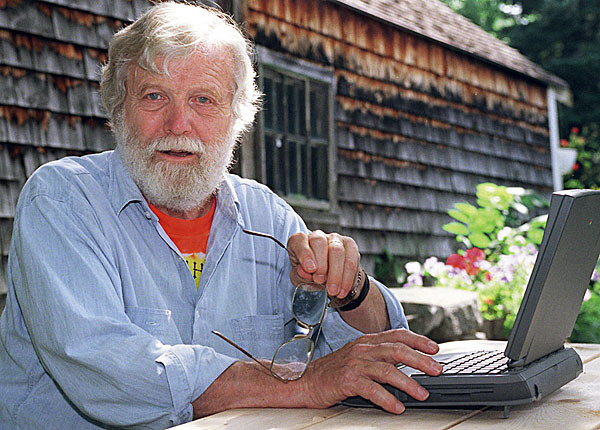 A former Bucksport resident, Ives served as director of the Maine Folklife Center for 22 years. The center started out as the Northeast Archives of Folklore and Oral History, merging with the Northeast Folklore Society in 1992. Ives served as a folk arts panelist for the National Endowment for the Arts, a fellow of the American Folklore Society, a member of the Maine Arts Commission, and was appointed to the Acadian Cultural Preservation Commission. William Ferris, chairman of the National Endowment for the Humanities from 1997 to 2001, said recently that Ives had been a powerful presence on the national folklore scene for many years. The two met in the early 1970s, Ferris said, when Ives was involved with the Kennebunk-based organization Salt — now the Salt Institute for Documentary Studies — and Ferris was connected with Foxfire, a Southern folklife program for high school students based in Georgia. Ferris, now a professor of folklore and associate director of the Center for the Study of the American South at the University of North Carolina at Chapel Hill, said Ives will be remembered for his compassion and attention to detail in his dealings both with his students and with the subjects of his many interviews and articles. “Whenever he spoke about Maine, you felt like you were right there, in the presence of the incredibly important people whose lives he documented,” Ferris said. Ives brought Ferris to speak at the University of Maine twice — once in the 1980s, when Ferris gave a talk on the evolution and role of blues music in American culture, and again when Ferris was at the NEH. In 1991 Ives was presented the Marius Barbeau Medal, awarded by the Folklore Studies Association of Canada for outstanding lifetime contributions. He also received an Award of Honor from the Prince Edward Island Museum and Heritage Foundation in 1998 and the Annual Harvey A. Kantor Memorial Award for Outstanding Achievement in Oral History in 1979. Ives, a New York native who served in the Marine Corps, graduated from Hamilton College in Clinton, N.Y., received a master’s degree from Columbia University in New York City, and earned a doctorate in folklore from Indiana University in Bloomington in 1962. He began his teaching career as an English instructor at Illinois College in Jacksonville, and moved to the City College of New York before arriving at the University of Maine in 1955. Ives is survived by his wife of 57 years, Barbara Ann “Bobby” Herrel, two sons and a daughter. A memorial service will be held in the fall. In lieu of flowers, donations may be sent in Ives’ name to the Maine Folklife Center, care of the University of Maine Foundation, Buchanan Alumni House, Two Alumni Place, Orono, ME 04469-5792, and New Hope Hospice, P.O. Box 757, Holden, ME 04429. BDN writer Meg Haskell contributed to this report.